An installation version of No-Way Street is part of the Post-Cinema exhibition curated by Shaun Wilson, which opened today at RMIT Project Space/Spare Room in Melbourne, Australia. Unlike Martin and I, two of the Kubikov 13 Summer Open Academy collaborative video performance participants Lyllie Sue and Maciej Ostaszewski, actually managed to escape the confines of the Zlaté Piesky area into central Bratislava where they captured images of architecture and people around the city. In performance they fashioned these into an increasingly abstracted study as the lines and structures of highways and office blocks become repeated line and grid systems. Here is documentation video of their performance (QuickTime Movie, 37Mb, 11' 38"). Viktor Fucek and Tomáš Benko, on the other hand, strayed hardly any further than the immediate surrounds of the workshop space but made a little go a long way neatly demonstrating how the everyday, the immediate and local – a chair, a tyre - can become fascinating through changing points of view. They constructed a tripod mount that allowed them to shoot the same moving subject simultaneously from different angles, resulting in some nice surprising overlapping twin screen action. 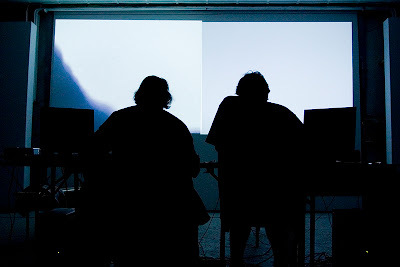 Here is documentation video of their performance (QuickTime Movie, 32Mb, 13' 39"). Both performances were accompanied by specially devised live soundtracks from participants in the collaborative sound performance workshop. I spent an intensive week last week at the Kubikov 13 Summer Academy in Bratislava with Martin Blažíček facilitating a video performance workshop. After a slightly uncertain start the six participants paired off and threw themselves into their appointed task of making a collaborative performance which was to explore ways of representing space and location. The workshops were located in a former cement factory near Zlaté Piesky lake (which provided us with a fresh supply of rather voracious mosquitoes every sunset), which is an apparently incongruous beach resort given that the surrounding area is a slightly overgrown, somewhat crumbling, rather neglected industrial desert, as well as being the location of the biggest Tesco store I’ve ever seen. Tesco thoughtfully provides a free bus service to and from the city centre 20 – 30 minutes away and most of the participants took the opportunity to visit and to capture video in the city. Martin and I didn’t visit the city centre as we were as busy making our own performance as we were with keeping an eye on the progress of the others. Instead we explored the rail yard behind our hotel with the notion of locating the source of the plaintive mechanical cries which had disturbed our sleep the previous night. We never did find the source of the sound but it was recorded, sampled and manipulated for the soundtrack to our performance, which also consisted of images of and through the stacks of rail, along and across the tracks in twin split screen loop compositions playing with perspective and temporal shifts. Here (QuickTime Movie, 42Mb, 19' 12") is video documentation of the performance we gave on the last night.